Seven more biblical prophecies have suddenly come into much clearer focus all at the same time. These are happening just eight months after the literal fulfillment of the astronomical aspect of the Revelation 12:1–2 prophecy on September 23rd and 24th last year. 1. A ten nation military confederation is set to be launched by Emmanuel Macron next month in Paris (Rev. 13:1; Dan. 7:7–8). 2. Turkey's dictator Erdogan has just held a historic conference of Muslim nations in Istanbul to take back Jerusalem from Israel, finally bringing together the missing members of the Ezekiel 38 alliance (Sudan and Libya). Interestingly, certain Gulf states' leaders were not in attendance, including from Saudi Arabia (see Eze. 38:13). 3. The Trump Administration is set to unveil its Middle East peace plan next month that might divide Jerusalem, but possibly give Israel sovereignty over the Old City and thus the potential go-ahead to build the Third Temple. 4. "They were marrying and being given in marriage." (Mt. 24:38–39; Lk. 17:27–30). Jesus' prophecy about the condition of normalcy before the Day of the LORD couldn't have come more clearly into focus than after the royal wedding between Prince Harry and Meghan Markle—perhaps the most widely witnessed and televised wedding in history—just a week before Pentecost and roughly four months before the Feast of Trumpets. I'm reminded that God is sovereign over the details of our lives (Acts 17:25–26) including the details of this wedding. Prince Harry was 33 years old when he married Meghan Markle. Likewise, Christ, by most accounts, was 33 years old when He pledged Himself to His bride on the night before His crucifixion. Christ is also a prince, though the Prince of all princes. He is taking a mixed Gentile bride like Mrs. Markle. And most pointedly, Meghan was not given to Prince Harry by her own biological father, but by the groom's father—the future king. Likewise, the bride of Christ is also given in marriage by the Groom's Father, the King of the universe (Jn. 6:37). Last week's royal wedding pales in comparison to the cosmic royal wedding to come. 5. "While people are saying, 'Peace and safety,' destruction will come on them suddenly, as labor pains on a pregnant woman, and they will not escape." (1 Thess. 5:3). North Korea is on the verge of denuclearization and making peace with its southern neighbor, ISIS has been kicked out of Iraq and the Syrian government is reporting that Damascus is now "completely safe," the Iran Deal has been undone and Iranian infrastructure destroyed in Syria, and talk is building about a possible resolution to the Israeli-Palestinian conflict. It seems as though the world has suddenly become much safer and that's exactly what we would expect shortly before the rapture. 6. The possible dual fulfillment of Daniel 9:25. This ancient prophecy tells us that a period of 69 weeks of years would begin when a decree is given to "restore and rebuild Jerusalem." The period would end with the arrival of the Messiah (Jesus Christ). It is already well understood that Daniel's prophecy pinpointed the exact day of Jesus' Triumphal Entry (Jesus' first arrival) in either 32 or 33 AD (with the decree being given by Artaxerxes in 445 or 444 BC for Nehemiah to rebuild Jerusalem's walls). 7. Kilauea and Isaiah 26:19–21. If you're a longtime reader of Unsealed, you'll recall that we have discussed at great length the Bible's many "woman in labor" passages (Revelation 12 chief among them). The Bible contains a great many of these passages and most are clearly connected to the Time of Jacob's Trouble, also known as Daniel's 70th Week or the Tribulation. In Isaiah 66 and Revelation 12 we learn that the prophetic woman gives birth to a corporate male child before the Day of the LORD begins. This male child is the Church, which escapes to Heaven before the woman Israel begins having birth pangs (Deut. 32:19–21; Is. 26:19–21; Is. 66:7–9; Zeph. 1:14–2:3; Mic. 5:3; Lk. 21:36; 1 Thess. 5:1–9; 2 Thess. 2:3; 7; Rev. 3:10; 4:1–2). After the child's escape the woman goes into labor, which is described in great detail in Matthew 24 (known as Jesus' Olivet Discourse). The resurrection and rapture of the Church are prophetically described in Isaiah 26 (vv. 19 and 20, respectively). Notice that in verse 19 the resurrection is likened to the earth giving birth to the dead. When a birth is about to occur a woman's water breaks and her cervix dilates. When contractions begin there is pain that often feels like a burning sensation. This is commonly called the ring of fire and if you've been to a childbirth class you may have heard the term. The earth also has what's called the "Ring of Fire"—the most seismically active area on earth, a ring of extreme volcanism surrounding the Pacific Ocean. Guess what's smack-dab in the middle of the Ring of Fire? The Island of Hawaii and Mt. Kilauea, which has been erupting for several weeks now. The volcano has expanded past the caldera and 22 fissures have opened up in the area. Some of these fissures are beginning to connect and expand as liquid lava is spilling out. Compare this to how a woman's amniotic sac breaks shortly before labor and her cervix dilates to make way for the baby. Fluid rushes out. Could what we see happening in Hawaii be pointing to the prophecy in Isaiah 26? Remember that we are approaching the end of the Fig Tree Generation, 10 conditions demonstrate that we are very near the end of the age, and 20 other clear signs have been fulfilled in just the last few years. Only seconds 'til midnight remain. Be ready. Thank you, Gary. Another great article. There’s only one point I would disagree with. I hope you’re wrong and I’m right. I do not believe that the Trump peace plan will include terms calling for the dividing of Jerusalem. I know there have been reports to this effect, but I believe that our president took Jerusalem off the table when he declared it to be Israel’s eternal capital and I do not believe this plan will include those terms. I believe what we’re seeing to that affect is fake news. I hope you're right for the country's sake. Time will tell. One thing though, Abu Dis is generally thought to be Eastern Jerusalem. Something I'm studying and I would encourage all of us to study more: what is the definite turning point that starts the rapture and/or trib? 1. The rapture's occurrence is seemingly disconnected from specific human actions in Israel and Jerusalem and could happen before any deal is made or war occurs. 2. 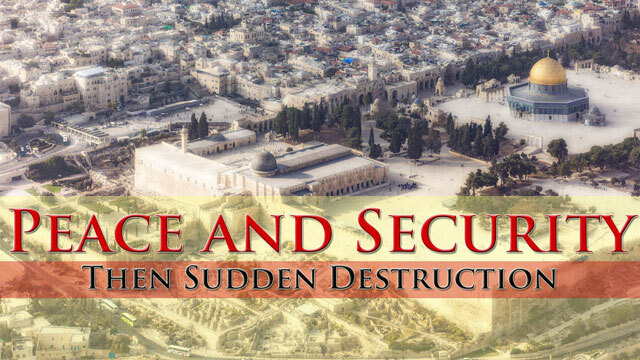 A deal divided Israel and/or Jerusalem is agreed to and God intervenes with the rapture or trib (Zech. 12). 3. Israel takes all of Jerusalem in a deal and then begins rebuilding the Temple—a blasphemous thing to do—and God intervenes (Is. 66:1–6). 4. Whatever the sign of the dragon is (from Rev. 12:3—4) makes its appearance and the Church is in apparent mortal danger from satan and his minions (which may present themselves as extraterrestrial beings)—and God intervenes via the rapture. I too heard President Trump say Jerusalem is off the table. @Gary, Could it be that Revelation 6:9-11 tells us more about this beginning? “When he opened the fifth seal, I saw under the altar the souls of those who had been slain because of the word of God and the testimony they had maintained. They called out in a loud voice, “How long, Sovereign Lord, holy and true, until you judge the inhabitants of the earth and avenge our blood?” Then each of them was given a white robe, and they were told to wait a little longer, until the full number of their fellow servants, their brothers and sisters, were killed just as they had been.” These ‘Souls’ ask the same question: “When will it begin?”. But what is this alter, where is it. What does it mean to be under this alter, not before it or at the base? And what is God really telling us about those souls? They are not disembodied spirits, they are visible to John. Nor are they the lives or selves of slaughtered victims as a kind of abstraction, nor are they in a intermediate state between a physical death and the final resurrection. These souls are people with voices and real bodies, like the beheaded of 20:4. They are martyrs, not just in the sense of bearing testimony, but in the sense of having been killed for their testimony. What can the context tell us and what is their prayer? 4. Whatever the sign of the dragon is (from Rev. 12:3-4) makes its appearance and the Church is in apparent mortal danger from Satan and his minions and God intervenes via the rapture. As a mighty wind from the mouth of G-d parted the waters, so too may a mighty wind split open the sky and shepherd us away. Good thoughts. I've focused so much on all the signs pointing to the nearness of the Day of the LORD, but now we are already there or unbelievably close. Many things are happening simultaneously, which makes me think that it is becoming increasingly important for the watching Church to be aware of whatever that trigger is. Red dragon is something red that has fire coming from one end since John was describing what he saw. So maybe he saw a weapon of war that was red and if it was a rocket of some sort, the fiery end, in his mind, was the mouth and the other end was the tail. We would know this the other way around. This rocket, if powerful enough like a nuclear weapon, would knock stars from their place. Why is it red? Communist. China's missiles are red, I think. Both symbols are slightly different and 22 days apart, and I will let others like Jimboni and Sheila and anyone else unpack them if they wish. But I strongly believe that we are being shown that our escape is close but that the dragon is also very close. 1. Peace conference between Trump and Kim. 2. Peace plan to be unveiled. 3. 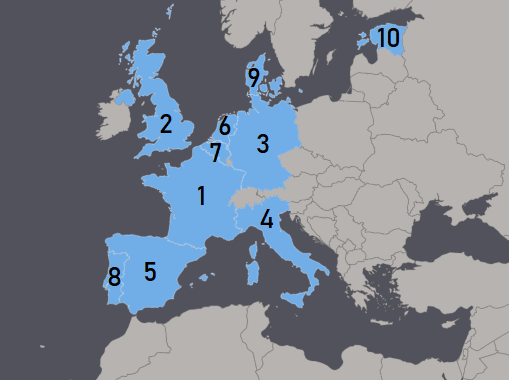 Macron's 10 nation alliance treaty is signed in Paris. Great thanks Gary and Miguel! Amazing summary indeed! Studying all of this and praying for you all! Blessings! Maranatha! An "inside" look at the conflict from an Arab perspective. The crux of the topic is that the Palestinians are frustrated that the Arab world is not doing enough to help them. The change of focus of Arab countries to other priorities is a central theme. Interesting program easily understood to a Western "outsider" and shared to offer a greater appreciation for the overall picture, the underpinnings of what may drive future conflict in the region. Exactly, it's the simplest most obvious timeline that may wind up being the right timeline. Exciting possibility. My two cents...the trigger is when the wolves provoke God by going for the true sheep and true sheep are abandoned by the hirelings...we are there now...very few see...can no longer tell sheep from wolves because of ignorance of Scripture or worldly hearts. It's the last test to reveal hypocrites...So God Himself rescues ..so...yes...any minute now. Anyone listen to this Amir Tsarfati new message given at a prophecy conference in Cincinnati? It’s excellent!!! I hadn't heard this one, but his follow-up from Jerusalem after the Israeli attack on Syria was pretty phenomenal. the 1985 completion. Then I thought if Jesus was 33 when he was crucified, 33 years from 1985 is 2018. Then the 7 year trib starts and finishes would be 40 years and we all know the significance of 40. Add that to all that everyone on this site comments on this subject...makes me laugh my head off with joy. The Lord seems to be making everything so obvious about his soon return. Nice thoughts. I've added two more points to the article (#6 and 7) above and have some thoughts on the 49 years concept. Gary, excellent article, as always. I wanted to point out something. Please just take it as food for thought. Please don't cut me down for simply thinking out loud: I think everyone knows Emmanuel Macron, and Gary mentioned his recent activity lately above. What if, not long from now, he is suddenly perceived as a man of 'great things' to the Jewish people, and they identify him as the same 'E(I)mmanuel found mentioned in, say, Isaiah 8:8, and believe this is their long awaited Messiah? -My last name has 7 letters. -8s are plentiful on my birthday OCTober 8, 1984 @ 8:18pm. Anyone else have interesting numbers to share? God bless! blessed hope 2018 recently changed to june 21st..
No idea if all that will come to mean anything just found it pretty interesting as things converge during the beginning of summer. Today is May 23, 8 months exactly since the Revelation 12 Sign. I kinda was on the lookout today for something big and your article fits the bill. Yes, it looks like a lake of fire. The images are truly apocalyptic looking. What a sign from God ! Thanks a lot for all your work in this site. It has help me a lot. The us ambassador just got this poster/wall picture showing a temple instead of the Muslim dome. They really are planning the temple. Yes I saw that on zerohedge. Hilarious indeed. No way ever someone can tell me this was some kind of "mistake" as Paul Begley instantly commented on YT... This is agenda not a mistake or trickery. Very telling! MARANATHA! -In a dream Nuclear explosion over Paris which the Lord did not explain to why or what this is about. -The Lord told me that he had a plan for North Korea and that was all he said. I do believe North Korea may be the last nation and he wants to save as many people there. -Their will be fear which will run rampant across this nation and around the world, we as believers will step out and we will shine. Many will come to us seeking answers and we will explain how they can escape all this and this is where we will bring them to Jesus our Lord and Saver. I also believe not long after this, the rapture will happen because I can sense this was the season and we were trying to gather as many people so that they can all be saved. Sorry, wrong word used after nation and around the world, I meant to say "are now protected". I have considered this a strong possibility for months. And to be clear, this scenario could unfold start to finish over the next few weeks. These are people according to Proverbs 29:1 and their destruction will be "sudden". Absolutely no contradictions in scripture. "Peace and Safety is not about Nations but about people and the Lord"
It's the same for the fig tree. "When his branch is yet tender, and putteth forth leaves", it's not about the city of Jerusalem in 1948 and 1967. It's about people and the Lord. Jesus cursed a fig tree that had no figs (it was not yet the season). Nathanael was said by Jesus to be an "Israelite indeed in whom is no guile" because Jesus saw him under a fig tree (in opposition to the people in the temple where Jesus overthrew the tables). The fig tree is often cited in the Bible, but it's never about geography or politic. This seems to be a time marker throughout scripture. Therefore, her young men will fall in her streets, And all the men of war will be silenced in that day," declares the LORD of hosts." I stopped to wonder a bit about why that, why The Woman in Labor? Sure it represents Israel I know, but also remember Genesis 3:16? The Lord tells Eve that her pain will be greatly multiplied and bring forth children in pain. The time marker seems to come full circle from that first prophecy to all parties involved. 23 Concerning Damascus. "Hamath and Arpad are put to shame, For they have heard bad news; They are disheartened. There is anxiety by the sea, It cannot be calmed. 24 "Damascus has become helpless; She has turned away to flee, And panic has gripped her; Distress and pangs have taken hold of her Like a woman in childbirth. 25 "How the city of praise has not been deserted, The town of My joy! 26 "Therefore, her young men will fall in her streets, And all the men of war will be silenced in that day," declares the LORD of hosts. 27 "I will set fire to the wall of Damascus, And it will devour the fortified towers of Ben-hadad." - The Hawaii volcano continues to threaten the ISRAELI built geothermal plant. I am watching with great interest to see if the lava hits the plant around 3.5 (24-25 days)weeks after 3 May (when the lava flow first started) which would be around the 27th of May...all for obvious reasons. - Markle was an actor in her previous life (masqueraded as someone she wasnt) (cf. wolf in sheeps clothing). USGS is now reporting a natural lava wall has blocked further advance of molten rock toward the geothermal power plant. Prayers of the saints and the hand of G-d at work? that would be amazing...and incredibly prophetic! Yeah...didn't happen. PGV is trashed. As the 70th Year Anniv of Israel went (and we are in the full year long celebration of the 70th year) We saw incredible "key words" . The Ezekiel 38 "SPOIL" concerning the alliance of Russia , Iran and Turkey. Lastly, keep your eye on SOPHIA The AI. https://singularitynet.io/ It is what I believe will be the key to govern everything...all our data will one day be controlled by one entity. I cant explain it by text. And don't forget the biggest sign of all ... The United States of America, the world's most powerful nation, has a president with the last name of "Trump." I don't think I have to tell anyone here that, according to the passages of scripture, the rapture will be initiated with the sound of a "Trump." Would anyone here believe that the Hale-Bopp comet of 1997 is prophetically connected to the year 2017 and the election of Donald "TRUMP?" It does. The hits just keep on coming don't they? I wrote about it on my blog site. Link below. Glad you mentioned this "trump" aspect. The blatant prophetic unraveling of this last trump could be so brilliant. I mean, I've wondered if he will die/ be killed/ be overthrown right before the rapture. That would be a God-level play on words! Resetting a cell phone can be useful if you need to remove your personal information prior to selling or disposing of your cell phone. You may also need to reset your cell phone to data error cyclic redundancy check initialize disk; such as freezing, slowness, and other defects that require you to restore the phone back to its original state. Perform a factory reset if your Kindle continues to malfunction. Wonderful Gary! Thank you again for your work. Does anyone remember if there was to be a significant planetary conjunction or something with the moon in June? Seems like that was mentioned awhile back. That is easy to find out. What day/dates would you like to see? June 27 Saturn at opposition, Saturn visible all night. Gary, thank you for the article as I learned a few things! The Holy Spirit revealed to me though over the past 6-8 months that the man child born from the woman in Revelation 12 is not the church- it is the 144,000 described in Revelation 7, Isaiah 491-7, Isaiah 66:7-9, Joel 2, Isaiah 60:1-3, and Isaiah 61:1-3 among many other scriptures. The man child will be caught up to heaven, transformed into Jesus' exact image, and return as His warrior bride to help bring in His great harvest of souls. His Bride will receive the latter rain outpouring of the Holy Spirit, and will finally do greater things than Jesus Himself did while walking the earth as a man. The church=Israel and is the woman in Revelation 12, and will be taken into the wilderness and supernaturally protected from the antichrist for 3.5 years until Jesus returns on the clouds. Thank you Gary for putting this together. 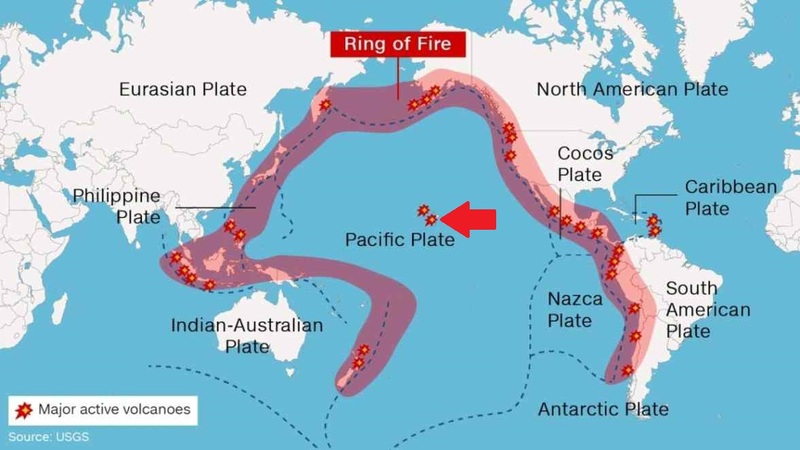 Re the Ring of Fire map, it is clearly noticeable how the ring circumvents Australia, by design? I suggest it is and done by the Master Designer. In 1606 the Portugese Navigator de Quiros, exploring the South Pacific, sighted land, and declared it to be ‘Terra Australis Del Spirito Santo’, The Great South Land of the Holy Spirit. Furthermore it was Australian soldiers in the Fourth Light Horse Brigade who on October 31st 1917 were instrumental in liberating Beersheba as part of the wider British offensive collectively known as the third Battle of Gaza during the First World War. Australia Votes Against UN Investigation On Gaza Violence, One Of Only Two Countries To Do So, the other being America. God bless America and Australia! 2. The Iran Deal was passed in congress near Rosh Hashanah 2015 which began the last 7 years. 3. The Revelation 12 sign happened near Rosh Hashanah 2017. 4. The great Solar Eclipse crossed America 33 days before that. we arrive at end of January 2019 which is nearly 70 weeks from the Rev 12 Sign. 7. February 1st is the 40th anniversary of Iran’s s Islamic Revolution. 8. 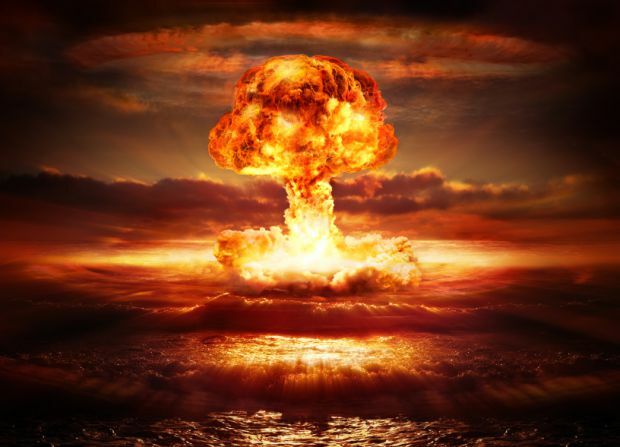 Iran is threatening to restart their nuclear program and destroy America and Israel. 9. Emboldened by the opening of the American Embassy in Jerusalem, Israel may start their sacrifice. Breaking Israel News has an article “ Can Hanukkah happen today” which explains that to start the daily sacrifice all that they need is the will and determination of the Israelis. They explain that the sacrifice can start in just four hours. They don’t need a temple or red heifer. 10. So the Rapture and the beginning of the Great Tribulation can happen in January 2019. The Tribulation Period Temple mentioned in Revelation 11: 1,2 speaks only about the Altar and the people who worship there. And special mention is made to leave out the court which is under gentile control. IRAN founded the ECO which consists of 10 Muslim Nations. Iran has grown in power and has spread its influence in many countries of the Middle East and has reached the northern border of Israel. This is called crescent of Iran’s influence. Gary, Thank You for summing this up! Good points! I'm very interested in #6 and #7 especially, great find! Please check also out our Jerusalem brother on YT "NICK VANDERLAAN" he's got some stunning insight into the Enoch calendar date for Shavuot (3-4 June this year) as he made connections to birth date patterns in the bible. Check it out please, it's very helpful! I find it also interesting that there is a British Royal Israel visit planned for "summer 2018" or "next month" (June?) but I couldn't find a specific date yet in the online press. I find this very obscure as such official visits are not just decided over spontaneously like some private holiday trip on weekends. OK I was just one day short... Today debka.com announced 24th June for that visit so the date is out now. Also anyone following the talks with China regarding ZTE? Also concerning that China seems to have the upper hand on negotiations with Trump. Does China really control our telecom systems? You all got some good info. Wow! Wanted to comment on trump thing. In king james version, 'trump' used once in old testament in book of jeremiah and twice in new by apostle paul instead of standard 'trumpet'. For all us 'number crunchers' out their..The king suleiman decree being 69 sevens or 483 years to 2018 along with Israel's 70 anniversary is amazing. There's also a bunch of other stuff going on like what's in this article. The Lord is really putting all this 'over the top' for us all! The king suleiman decree being 69 sevens or 483 years to 2018 along with Israel's 70 anniversary is amazing. Those two things right there are really making me wonder if we're looking at the rapture occurring this year or something else occurring of major prophetic importance that will hasten along the prophetic timeline leading to the rapture. Something is up. I cannot find another article I saw recently on how China communism has been involved by the CIA from the very start. You have been fooled if you believed into real opposition. This is all a long-term agenda leading into NWO fascism. Don't let Satan fool you any longer. If you study on how China ALWAYS treated their own people and how their philosophy and war strategies are you will understand that in fact they own already half of the globe (perhaps more). Their ruthlessness in trading and contracting is systematic and understandble from mentality and history. You won't believe what and how much China already controls. The Bible lays out some pretty specific timing for events. We don't have dates as much as we have timings and time between events. Daniel is one such place we get these. There are several YTer's out there that dedicate their time to researching these aspects. I don't always agree with Steve but he does search diligently and reports what he finds. Have your Bible and a refreshing drink handy and be prepared to do some note taking. Great way to dig deep into the Word regarding prophecy. Thank you Pastor Rich for your reply! I look forward to digging deep! Not sure if anyone has already commented on this maybe in another article but I looked up the meaning of Leilani in Hawaiian and it menas "Heavenly Child". Leilani Estates = Heavenly Child's Home...right at the center of the Ring of Fire. Pretty cool! Well Phil, that's pretty cool. The meaning behind words and numbers and events in the news is remarkable. Statistically it is impossible that there would be this many things which speak of the time we are in so blatantly. God is so gracious to give us this, on top of all the things He has already given us in His word. PS if you do not visit dailycrow.com regularly, you probably want to check it out. The guy, Matt, who writes the content is brilliant at seeing the symbolism and connections in the news that could only be the hand of the Almighty. Yeh Maddie, the YTer's and reading articles here by Gary and others on this site is a big start. What amazes me is the fact that so many people who have studied and researched bible prophecy alot more than I ever could seem to have an agreement that the Lord is coming soon. He has had them all appointed for this specific time in history. The rapture is 'imminent' they would say. If you read some of the comments like the previous one here...there's no doubt that Jesus is trying to get our attention! Amen spiritoftruth and Maddie , even though the world is so evil its almost unthinkable and the natural disasters are so horriblie frightening I wonder just how much more this earth can withstand before it literally explodes. BUT , I still feel so blessed to be part of this generation and this time simply because I truly feel we were hand picked by G-D almighty for this moment. Just stand and think we ARE the chosen people that will never experience physical death, how awesome is that, all praise be to JESUS. Regarding the royal wedding - interesting to note that the Bride’s real first name is Rachel. NONSENSE.What is wrong with You people.Not everything is biblical in fact nothing of what was posted is Biblical but man made creation.Man made assumptions.The warnings of Yahsuha were all fulfilled.It is just a matter of waiting for Him.You are expecting a man of perdition?then look at the image that was created By Constantine during The Council Of Nicaea...The Famine will be not of bread But Of Yahuah's Word....The hour of temptation?No hair will be harmed during The hour of temptation...the scriptures are VERY Clear.The ANtichrist comes first then Yahusha.The antichrist is being Worshiped now since 2000 years ago.Jesus a false Image of the Real Messiah.who are we worshiping since the last 2 millenial?The First Seal..It is clear The Man of perdition an image create dby Constantine comes first, Then Yahusha.Expect Yahusha this 2018 Trumpets or any Trumpets from Now on. Everyone here is looking for Christ's return correct? Well I would check out www.ra-el.org please keep a open mind. Times are much later than most believe. Pregnancy is 10 months, not 9. 40 weeks. Will pets sense that we are "leaving" soon? Yes, but it seems close enough. That reminded me how when Jesus said we will know that 'summer is near'? Interesting, first day of summer. Gary and everyone, JARED begat ENOCH. The word Jared is used one time in Luke in new testament, five in old. We know that Enoch was representative of a rapture?? To the people with pets and worried about loved ones...Jesus told us not to be worried or let our hearts be troubled and that goes for everything. I know its tough on us but we have totally trust in him. Rothmn - What? Who said it was 9.40 weeks? That’s just a little over 2 months! That can’t be right! Anyway, I think the average pregnancy is around 39 weeks, which is 9 months, not 10. One month is 30.4 days. So, 9 months is 273.6 days or 39 weeks. Rothmn - Oops! I apologize. I thought you said "9.40 weeks" (I didn't see the space. Silly, tiny Iphone screen!) But according to WebMD.com, the average length (due to improved fetal monitoring) is actually 39 weeks (which is 9 months, as has been claimed for as long as I can remember.) However, that can vary by a 2-3 weeks either way and still be considered 'normal'. 'Near'. Good word the Lord uses. I come to this site because my girlfriend and nobody in my family wants to talk about bible prophecy. The enemy is relentless in his attacks sometimes and we need to keep each other strong. Enough of what I think for awhile. I'm more interested in what you all have to think and what you read and learned. We must be close to getting out of here, right? The only legitimate point is number 2. Turkish President Erdogan has gathered the Islamic nations against Israel. Is that unreal or what? Who else could that be! I believe our pets will be with us in Heaven. Jesus is so good and kind that He will make it happen just to make us happy. A great book on the subject is "There is Eternal Life for Animals" by Niki Shanahan. She did an in depth study of the Hebrew and Greek Bible and makes a very compelling case for animals in Heaven. Nothing is too hard for the Lord. Hmmm, sounds to me like there are animals in heaven! Amen. I also highly recommend Mary Baxter's books 'A Divine Revelation of Heaven" and "A Divine Revelation of Hell". If any readers have a prison ministry, these books are crucial. Mary has YouTube videos also. In my humble opinion, people get hung up on this because they assume that the belief in animals going to heaven somehow puts them on the same level as people. But if the Garden is a reflection of heaven, then of course, animals will be there. The bible also refers to the "spirit" of an animal. So far as I can tell ALL spirits are eternal creatures. I also believe they will be raptured with us, not only because of the Exodus and Noah examples, but because G*d IS love. I cannot picture a loving Creator taking His children to Heaven and leaving behind thousands and thousands of beloved pets to die slowly of thirst and hunger. @Archangel - From what I can tell, Mary Baxter is a false teacher/prophet. Her theology is far out of bounds from orthodox Christianity, fundamental doctrine, and the teaching of the Bible-believing evangelical community. She is way out there! I can provide a long list of false teachings, if needed. My advice is STAY FAR, FAR AWAY from her website, books, and YouTube videos! I don't know about the author, but I too recommend the book "A Revelation of Hell". I have seen people - even Christian people - changing for good after having read this book (The book is now available for reading online in many languages). I bought the book before and I can say that if hell is as horrible as what is written in the book, and it's even worse as in the vision Jesus said NOT to write some part of it, then I DON'T WANT EVEN MY WORSE ENEMY OR THE WORSE PERSON ON EARTH TO GO THERE! But BEWARE, there are now people that abuse of the revelation of hell to rob other people by adding their own extra visions about people not tithing, saying things like having seen in hell "people that think that tithing only make the pastors becoming more fat, not understanding that all is for the glory of God"! Good morning family I pray everyone is doing good as we walk by faith not by sight in these dark dark end days ! The Flood will bring the Rapture. Jesus said 'I shall Return when the Days are like the Days of Noah'. There are only 2 parameters that set that generation apart. The approaching Neutron Star System (The Dragon) causation affects upon our Waters. The Oceans shall simply move. Not to destroy the Earth, but about 2.5 billion people. "The Woman was given Wings, but the Dragon spewed Water at her." After those have been taken, there will be millions of people left with nothing after the Flood, and will be desperate for a Savior. Enter Petrus Romanus, the Jesuit who holds the Papacy, the Last Pope. He will introduce those left to their 'Savior', the Giants/Fallen Angels. For if one does not die (born again) one cannot enter the Kingdom. God stepped in and RESCUED us from this fate in the Garden. But they will try again with AI and Life Extension. Those who accept his, again will never die, and never be able to enter the Kingdom. "That which is Spirit is Spirit. That which is Flesh is Flesh." Those who don't accept this, and remain loyal to Christ will have their head cut off. Why decapitation and not shooting? "For those that revere My Name, the NEW SUN of Righteousness will have HEALING in it's WINGS, and you shall frolic like a well fed calf." God has specifically pointed out what type of Star this will be. For a Neutron Star is the only Star with WINGS. They are Neutron Emissions venting out of her sides that resemble Wings. When these Neutron Emissions envelope this Planet, all organic shall be reanimated by the Magnetite (Crystals) in your Brain. "Men shall wish upon Death, but Death shall not come." But if they don't separate you from this Magnetite that is being affected by the Neutron Emissions, then you would only reanimate and come back. And they don't want Christ followers in their NWO. I could go on, and if you'd like to hear more of what the Father has revealed to me, let me know. @ Rockstar Preacher - Are you really sure about that? Matthew 24:37-39 says "But as the days of Noe were, so shall also the coming of the Son of man be. For as in the days that were before the flood they were eating and drinking, marrying and giving in marriage, until the day that Noe entered into the ark, And knew not until the flood came, and took them all away; so shall also the coming of the Son of man be." Verse 39 says the flood didn't start until Noah and his family were safely in the Ark. But you're saying that there will first be a major, world-wide flood, and then the Rapture? To me, it sounds as if it will be 'business as usual' when the Rapture happens...eating, drinking, marrying, etc. are pretty normal activities, NOT magnetic rocks in our heads effected by emissions from a neutron star. I'm pretty new to this, but everything I've heard from others is to compare all claims to what the Bible says. That's what I'm trying to do. Just learning says, "To me, it sounds as if it will be 'business as usual' when the Rapture happens...eating, drinking, marrying, etc. are pretty normal activities, NOT magnetic rocks in our heads effected by emissions from a neutron star. I'm pretty new to this, but everything I've heard from others is to compare all claims to what the Bible says. That's what I'm trying to do." I reply, You are correct on both counts. It will be "business as usual" for the lost, and it should also be "business as usual" for us Christians right up to the moment when we are surprised by our rapture. See https://rapturejunkies.blogspot.com/?view=snapshot for more information on where these "Rapture Junkies" have gone astray. Thank you so much for sharing that! Just did a search on it. Nobody can explain it. That's phenomenal! 7. The ring of fire. It makes me think of a fire-breathing dragon. The meandering path resembles the constellation. It is 120 days from the start date (2/21/18) to the end date (6/21/18), but not including the end date or 4 months excluding the end date. Interestingly enough too, the ministry that my wife and I are in will mark it's 240th week of operation come 6/21/18! Glory to G-d in the highest!! Not to be picky, but it isn’t when contractions BEGIN that the “ring of fire” sensation occurs; its when the woman is finishing transition and actually beginning to push the baby out. Marge B says, "Not to be picky, but it isn’t when contractions BEGIN that the “ring of fire” sensation occurs; its when the woman is finishing transition and actually beginning to push the baby out." I reply, You're not being picky, Marge; you're simply asking a bunch of "Rapture Junkies" to be consistent in their interpretations, which they are unfortunately unable to do (since they are desperate to twist the facts to fit their need for a not-to-future Rapture date). See the articles and comics at https://rapturejunkies.blogspot.com/?view=snapshot for further analysis of where they have gone wrong. I know this article is a few months old, but I just discovered your website today and I'm catching up on your articles. I enjoyed this one and will get into the others also. I LOVE reading about the end times because I know it will be soon when He calls us Home and we need to be prepared and watching for that Blessed Hope! Thanks for the article and I'm glad to find a website that teaches the bible the way it should be taught. God Bless you! We're glad to have you here! Welcome! thought it was settled who the beast was or the antichrist? many great men of God concluded Caesar Nero.